Offer a haven to a "gardener's best friend" by adding the Esschert Design Basic Ladybug House to your landscaping. These familiar, beloved insects are often welcome in a garden, offering natural pest control by dining on aphids and caterpillars. This convenient, pine shelter creates perfect hiding and roosting spots for ladybugs, with its pitched roof and horizontal, oval openings. The insects can easily access the home through these openings, and a line drawing of a ladybug, along with its Latin name, adorns the top of the piece. One side of the home hinges open for adding leaves or other materials to the chamber, and a latch keeps the panel closed. This not only offers ladybugs a hiding spot, it also allows the home to be left outdoors through the winter and used as a hibernaculum. Use the keyhole opening on the flat back of the piece to attach it to a post, wall, or tree easily. The pine construction will withstand use for several seasons, and its natural finish weathers in a lovely way. 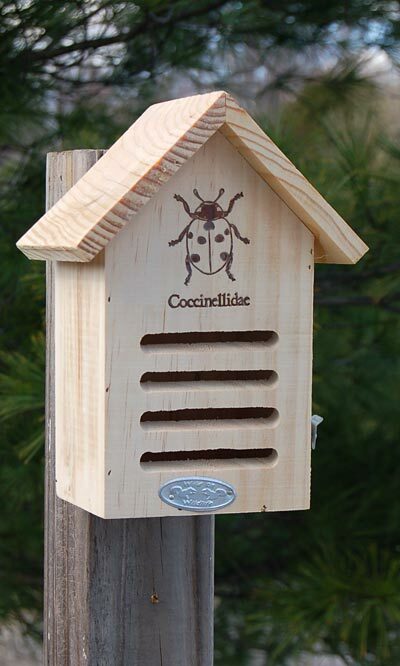 Invite ladybugs to visit your garden by placing this Basic Ladybug House in it.